The war of words between the government and opposition conservatives continued on Tuesday with New Democracy leader Kyriakos Mitsotakis calling out Prime Minister Alexis Tsipras over the fact that no one has resigned over last week’s deadly wildfires. “When someone undertakes political responsibility it should be accompanied by an act, and resignation is an act of personal responsibility,” Mitsotakis said in a press conference on Tuesday, referring to Tsipras’s claim last Friday that he is taking “full political responsibility” for the way the fire was managed. “I will do all I can to find answers to all the questions and make sure responsibility is attributed,” he pledged. “We are dealing with an unprecedented tragedy,” he said, and expressed confidence that judicial authorities will expedite the investigation. 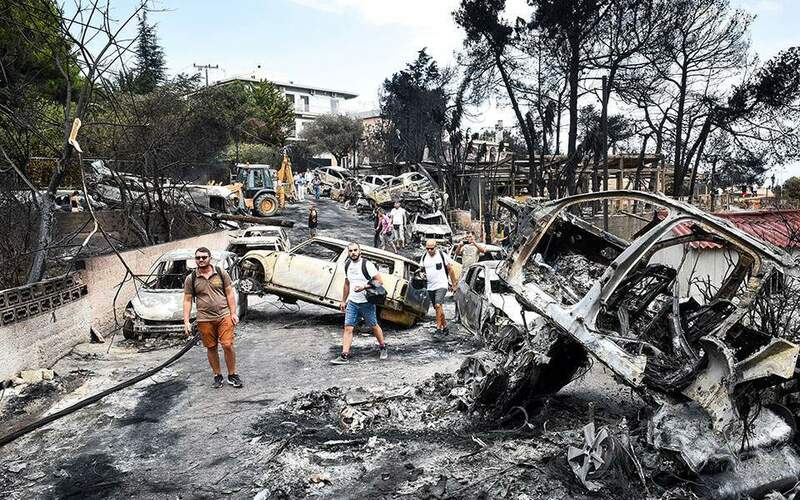 For his part, Tsipras has promised that the state will conduct an inquiry as to why hundreds of people found themselves trapped in the flames with no way of escape. He has also vowed to crack down on unlicensed construction, which the investigation has revealed blocked off escape routes toward the sea. According to government spokesman Dimitris Tzanakopoulos, the Environment Ministry has identified more than 3,000 illegal constructions in forests and along the coastline in the wider Athens region that have been marked for demolition.